The hidden support is a very popular configuration for breakfast bars and serving counters mounted on knee (pony) walls. Designed specifically to be used on a half wall, the Lincoln Top Plate hidden support is 12" long x 3.25" wide. Mounting Plate Specifications : 12" x 3-1/4"
As recommended by my cabinet dealer, I checked out Federal Brace products. That is where I came across the Lincoln support. 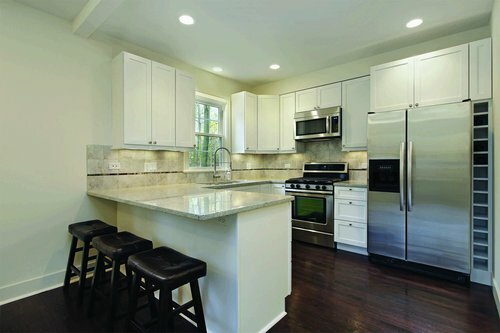 It seemed to be the right solution for our new kitchen and provided a simple to install solution. 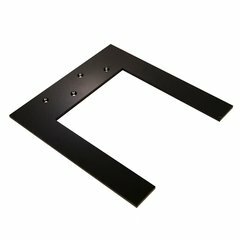 I purchased 6 brackets for our installation. The template had not seen this type of bracket before and was impressed. The countertop installers brought the quartzite slab,76" x 16", applied the silicone adhesive and set the stone in place in under 20 minutes. We have a secure bar top counter that was easy to install. Thank you for great products at reasonable prices.